Health insurance is just one of the many benefits offered in the Marine Corps. The health insurance offered to Marines has many complexities and at times can be confusing, and with that comes a lot of questions from parents. When to take your recruit/Marine off your insurance? When does your recruit/Marines' insurance take effect? What if your recruit/Marine is a reservist? Not only should Marines be aware of the benefits that are available to them, their families should be educated on them as well. First it's important to understand the different coverage options offered to Marines. The three main coverage options to concern yourself with are TRICARE Prime, Standard, and Extra. Reservists are also given the option of TRICARE Reserve Select (TRS). Active duty Marines are only given the option of TRICARE Prime. With TRICARE Prime you are assigned a primary care manager (PCM). The PCM will handle the majority of the Marines' health needs and will provide a referral to a specialist for anything beyond that. So basically the Marine/recruit will see the local Battalion Aid Station (BAS), and if there are any medical needs beyond their capabilities they will send him/her to the Naval Hospital. Recruits are automatically enrolled in TRICARE Prime upon their arrival at boot camp. They will remain under this coverage as long as their active duty status remains. Recruits that enlisted as reservists, as opposed to active duty, are considered active duty until they complete all of their training schools. This includes boot camp, Marine Combat Training (MCT) or Infantry Training Battalion (ITB), and Marine Occupancy Specialty (MOS) Schools. Once these schools are completed, a reservist will no longer be eligible for TRICARE Prime, however this is when they should look into TRICARE Reserve Select. They may also look into their own private health insurance if they choose to do so. 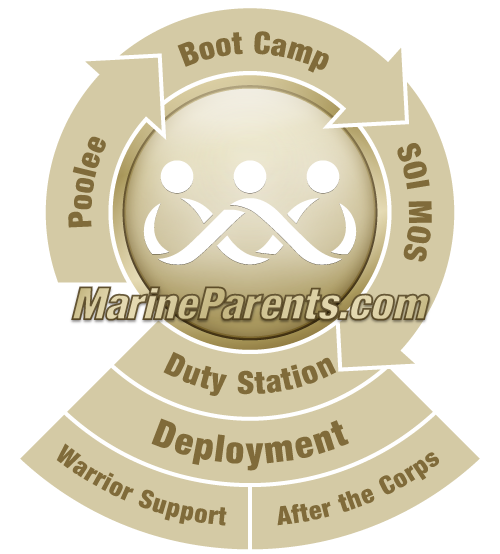 Another question parents may have is if it is at all beneficial to the recruit for them to stay on their parents' insurance while at boot camp. The only instance where I can see it being beneficial is for a reservist, who will no longer be eligible for TRICARE Prime after his training is complete. However, some parents may keep their son or daughter on their insurance plan until after graduation due to the possibility the recruit may not graduate. As stated earlier, any Marine on active duty is automatically enrolled in TRICARE Prime, and this includes recruits in boot camp. This frees them from any expense. While a reservist, under TRS, will be responsible to pay a monthly premium, co-payments for certain medical services, and an annual deductible. If the parents insurance offers more coverage at a cheaper rate than TRS then that is where the benefit to keep the recruit on their insurance lies. We recommend that parents reach out to their health insurance representative for guidance on making decisions. In the end, every situation is different. Each parent and their recruit must understand their own situation and make their own decision for how they should handle it. The decision is made much easier when all the necessary information is available. Ensure you and your recruit do all the research you can. Ask questions. When it comes to these benefits, all information should be considered pertinent.